The Great Silence is a 1968 Revisionist Spaghetti Western film directed and co-written by Sergio Corbucci. An Italian-French co-production, the film stars Jean-Louis Trintignant and Vonetta McGee (in her film debut) alongside genre regulars Klaus Kinski, Frank Wolff, Luigi Pistilli and Mario Brega. Conceived by Corbucci as a political allegory inspired by the recent deaths of Ernesto "Che" Guevara and Malcolm X, the film's plot takes place in Utah prior to the Great Blizzard of 1899. It pits a mute gunslinger (Trintignant), fighting in the defence of a group of outlaws and a vengeful young widow (McGee), against a group of ruthless bounty killers led by the psychotic "Loco" (Kinski) and the corrupt banker Henry Pollicut (Pistilli). Unlike most films of the genre, which were filmed in the Almeria province of Spain to double for areas such as Texas and Mexico, The Great Silence was filmed on location primarily in the Italian Dolomites. 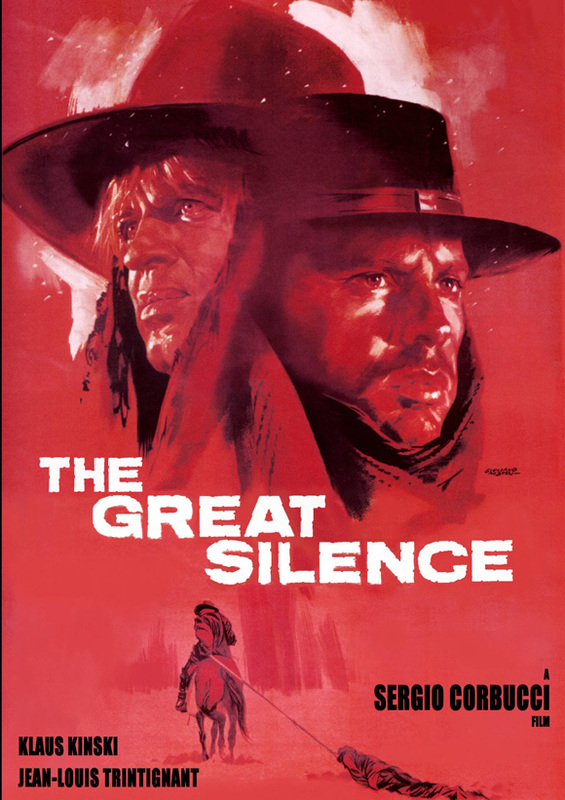 Distributed in Italy and various international markets by 20th Century Fox and its subsidiaries, The Great Silence only proved to be a modest financial success in the countries it played in. The film was withheld from release in the United States until 2004, when it was made available on DVD by Fantoma Films and Image Entertainment. Despite initially receiving controversy for its bleak and dark tone, the film's reputation grew, and it gained a cult following in the wake of its release. The Great Silence is now widely regarded by fans and authorities on Spaghetti Westerns as one of the greatest films of the genre, and is acknowledged as Corbucci's masterpiece. Praise has gone to the film's performances (especially those of Trintignant, Kinski, McGee, Wolff and Pistilli), its unconventional use of a mountainous, snow-bound environment, the soundtrack by Ennio Morricone, the ending, and its subversion of various conventions of the Western film genre.